Last fall, about a month before her Medicaid coverage was scheduled to expire, Darolyn Lee realized that she needed to get her contraceptive implant replaced. Lee, a 37-year-old in Chicago, called the managed care organization in charge of her plan to find out where she should go to get the new implant. She was told that the closest in-network provider was Mercy Hospital and Medical Center, a Catholic hospital about 30 minutes away by bus. When she got to the hospital for her appointment, the doctor said she couldn’t replace Lee’s birth control, but wouldn’t say why. Instead, she gave Lee a referral card for the hospital’s obstetrics and gynecology department. Lee, assuming that hospital bureaucracy was to blame, made another appointment and returned to the hospital a few weeks later. But when the second doctor walked into the room, she explained that she, too, could not replace the implant. She offered Lee a pap smear instead. In a statement, Mercy said it provides high-quality care that is in line with national standards, but declined to comment on Lee’s case. When Lee left Mercy for the second time, she still didn’t know why both doctors had refused to change her implant. She learned later that it was because of the hospital’s Catholic affiliation. Mercy and other Catholic hospitals are committed to a set of religious guidelines, the Ethical and Religious Directives, which interpret Catholic moral teachings to determine what kinds of medical care hospitals can offer. They include a blanket ban on abortion and restrictions on contraception, both of which are opposed by the Catholic Church. For Catholic health care institutions, the directives offer essential guidance to ensure that hospitals are offering care aligned with their religious identity. But as Lee’s case shows, insurance can propel patients into those institutions without informing them about the limitations on the services they can receive. Have you had an experience with a Catholic hospital that you’d like to tell us about? We’d love to hear it. Email us! Thanks to a wave of mergers and consolidations that has been reshaping the U.S. health care system, Catholic hospitals are playing a bigger role in patient care. According to a 2016 report by the American Civil Liberties Union and MergerWatch, an organization that tracks the ownership of medical facilities and advocates against religious restrictions on health care, one-sixth of hospital beds nationwide are in Catholic facilities. 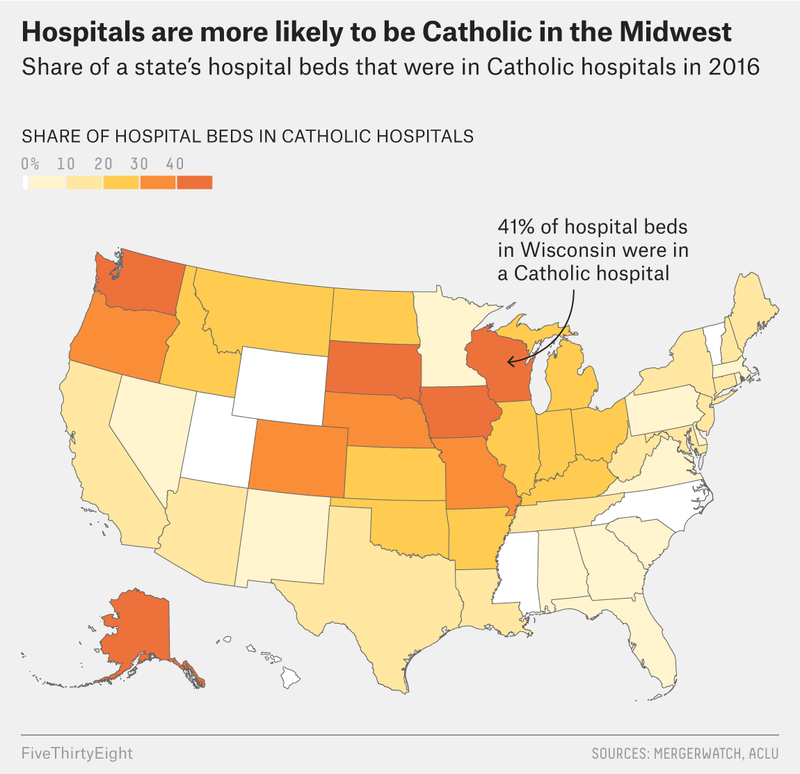 But those beds aren’t distributed equally — Catholic health care systems are especially heavily concentrated in the Midwest, for example. Nearly 30 percent of hospitals in Illinois were Catholic in 2016, according to the report. A new analysis of Medicaid plans in Cook County, where Chicago is located, shows how Medicaid can guide low-income women like Lee into Catholic hospitals. A group of researchers at the University of Chicago investigated the religious affiliations of Cook County hospitals that have labor and delivery departments and found that 38 percent of them are Catholic. But when they looked at Medicaid managed care plans, they found that nearly 9 in 10 reproductive-age women2 were enrolled in a plan where Catholic hospitals made up a bigger share of in-network facilities with labor and delivery departments than the share they accounted for in Cook County as a whole. In the plan that was the most popular among study subjects, CountyCare, 55 percent of in-network hospitals with labor and delivery departments were Catholic. Women of color are especially likely to be in a Medicaid plan with a high percentage of Catholic hospitals. Catholic providers have a long history of prioritizing care for poor and underserved communities, and their overrepresentation in Medicaid plans is likely related to that mission. But doctors and advocates express concern that when restrictions on care aren’t made clear to patients — either by Medicaid or by the hospitals themselves — low-income women may struggle to obtain reproductive health services like birth control. Lee ended up going to a Planned Parenthood in an inconvenient location to get the new implant and was surprised to find that her Medicaid would cover it. Precisely because there are so many providers who don’t offer contraceptives, most Medicaid managed care recipients are allowed to use providers outside their network for family planning — they are allowed to visit any health care provider that accepts Medicaid. But Sara Rosenbaum, a professor of health law and policy at George Washington University, said it’s understandable that patients like Lee might think Medicaid wouldn’t cover care at Planned Parenthood unless the provider was clearly in their network. “One thing that’s drummed into your head if you’re a Medicaid managed care member is that you have to go to providers in your network,” she said. It’s not just Medicaid customers whose access to care can be limited. Some insurance plans available on the Obamacare marketplaces include Catholic-affiliated health groups, and even standard health insurance plans like HMOs can make it difficult for patients to seek care outside of Catholic health systems without negotiating a maze of bureaucracy and referrals. Some doctors we spoke to dislike the Catholic health care directives because they can require health care professionals to deviate from standard medical practice. The directives limit access to birth control, ban sterilization procedures like vasectomies and tubal ligations, and, in emergency situations where a woman is miscarrying, doctors may not be able to induce labor or evacuate the patient’s uterus until the fetus’s heartbeat has stopped or the woman’s life is at risk. Ethics committees provide guidance on what is permissible in difficult or exceptional situations, but these decisions are made on a case-by-case basis. In numerous interviews with FiveThirtyEight, physicians who have worked for Catholic hospitals told us they believe these restrictions require them to provide substandard care. If a patient wants a tubal ligation, for example, refusing to provide it to her during a C-section means a second surgery, which comes with a greater risk of complications and higher costs. “Ethically, doing two operations when it’s safe to do one is absolutely wrong,” said Sheldon Wasserman, an OB-GYN in Milwaukee. This can create a serious tension with their employer, because Catholic institutions believe the directives are fundamental to their ability to provide care that’s aligned with their most deeply held values. Those include rendering aid to the poor, a commitment to the sanctity of life from the moment of conception, and a belief that couples should not use birth control (other than natural family planning) because marriage is intended for procreation. Charlie Camosy, a professor of Catholic ethics at Fordham University, has argued that standards in medical practice aren’t as objective as they might seem and that healthcare providers are constantly making value-based judgments about what kinds of care to provide. Catholic hospitals, he said, make their own value-based judgments. Why should these facilities be forced to offer services that violate their beliefs simply because those beliefs don’t align with other professionals’ opinions? Kevin Donovan, an expert in Catholic bioethics at Georgetown University, added that when doctors agree to work for a Catholic hospital, they are signing up to practice under Catholic guidelines. He said that in the situation outlined by Wasserman, the solution is to have the patient undergo only one surgery — just not in a Catholic hospital. But insurance can restrict where patients can go, which means some patients are being guided into these religious facilities without understanding the restrictions that come with going to a Catholic hospital — if they know a given hospital is Catholic at all. According to a survey conducted by Dr. Debra Stulberg, a professor and a director of research at the University of Chicago,3 37 percent of respondents whose usual hospital was Catholic-owned or -affiliated didn’t know that it was Catholic. More than two-thirds of respondents overall, meanwhile, believed that a woman could get a tubal ligation at a Catholic hospital upon request, and 30 percent believed that abortion is available when the fetus has a birth defect that will lead to its death. In 2016, Illinois passed a law designed to create more transparency about the procedures that health care providers won’t offer, partially in response to the stories of patients who, like Lee, weren’t given the full picture about what kinds of care they could receive. While major Illinois-based Catholic groups took a neutral stance on the bill, several anti-abortion groups filed suit over the law; the state has suspended enforcement while the court case proceeds. Even if the law is ultimately upheld, it doesn’t ask for the same transparency from insurance companies, which can offer plans with Catholic-only provider networks, making it difficult for patients within the plan to get contraception or other restricted reproductive health services without paying out of pocket. That’s what happened to Melanie Jones, according to two complaints filed in 2016. One morning, the then-28-year-old slipped and fell in her bathroom in Chicago and immediately realized that something was wrong — she was bleeding, cramping, and in almost unbearable pain. Suspecting that her IUD — a small piece of metal or plastic that sits in the uterus and acts as long-term contraception — had become dislodged, she made an appointment to get the device removed with the first in-network gynecologist who could see her quickly. It was the first time Melanie had been to this gynecologist’s office. She had recently moved to Chicago from Florida to attend graduate school and was working part-time to stay afloat. When she had gone online to buy health insurance from the Illinois marketplace a few months earlier, she chose a plan with a network of physicians affiliated with Mercy Hospital and Medical Center (the hospital system where Lee also sought care) because the doctors were nearby. The first appointment she could get was several days after her fall. The gynecologist gave her a pap smear and confirmed that the IUD was dislodged and would need to be removed. “I thought, great, we’re going to get this thing out of my body,” Jones recalled. But the gynecologist told Jones that, because of Mercy’s restrictions on contraceptives, the doctor wasn’t allowed to remove the IUD. No other physician in Jones’s insurance network would be able to remove it either, she remembered the doctor saying, because they were all affiliated with Mercy. She left the office confused, frightened and angry, wondering how she was going to get rid of the IUD. It took hours of phone calls, she said, but she eventually managed to switch her insurance provider and found a new gynecologist. Ten days would pass between when she first started looking for a doctor and when the IUD was removed. Through the ACLU, Jones filed separate complaints with the U.S. Department of Health and Human Services and the Illinois Department of Human Rights, arguing that Mercy Hospital had discriminated against her because she was a woman using an IUD to prevent pregnancy. The hospital system first argued that the doctor was misinformed — the physician could take out the IUD — and then subsequently denied Jones’ allegations, saying that the doctor offered to remove the IUD but Jones declined. Mercy also declined to comment on Jones’s case. The Illinois complaint was ultimately closed in February of this year, Jones’s lawyer said, after an investigator ruled that there wasn’t sufficient evidence of discrimination (the other complaint was withdrawn). Check out the previous installment in this series: How Catholic Bishops Are Shaping Health Care In Rural America. At times, Chicago officials have been criticized for their active support of Catholic health systems — like earlier this year, when the city council approved a $5.6 million subsidy to Presence Health to build its headquarters, despite opposition from Planned Parenthood and some aldermen, who expressed concern about providing public funds for clinics that wouldn’t offer abortions and may not provide birth control. This study was limited to women between 19 and 44. She was also a co-author of the research into Catholic hospitals in Cook County.